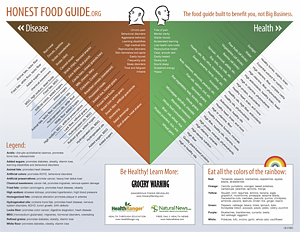 You may freely copy, print, or post the Honest Food Guide for any non-commercial purpose! Learn how to prevent chronic diseases like cancer, heart disease, obesity and diabetes, and take charge of your health by exploring the fundamental laws of nutrition. Discover how everyday foods actually promote chronic disease and how you can take charge of you health outcome starting today! This practical guide gives you the all-natural, breakthrough recipe for altering your physiology to be free of type-2 diabetes for the rest of your life. Strategies include food choice, physical movement, medicinal herbs that support the pancreas, food ingredients to avoid, and many more. Comes with a 100% satisfaction guarantee. Click here to learn more. There are seven primary ingredients that cause virtually all the skyrocketing chronic diseases now being observed in modern society. By learning how to identify and avoid these ingredients, you can stop poisoning your body and mind, and watch as symptoms of disease begin to vanish with each healthy meal. This breakthrough guide tells you what the food companies, the USDA and the FDA don't dare speak of: the exact names of the actual food ingredients that cause disease along with a wealth of how-to information that shows you how to avoid these disease-promoting ingredients for life! This authoritative guide will give you the inside scoop on the Big Business practices that are carefully designed to exploit your hard-earned money. You'll also learn hard-won techniques for thwarting their moves at every stage of the game. How to finally kick the soft drink habit for good! This report reveals the simple, proven, five-step strategy that thousands have used to reclaim their health from the soft drink companies. Free yourself rom soft drinks and help reverse obesity, diabetes, kidney disease, osteoporosis and even migraine headaches. Easy to follow! The HFG was created by Mike Adams, the Health Ranger, a man with a mission of teaching people how to be healthy. Adams is a holistic nutritionist who overcame obesity, crippling pain and chronic disease using natural health strategies he freely shares with others. To learn more about the Health Ranger and his articles, reports and books (many are freely available), click here.